The Fast ForWord Foundations II exercise Tomb Trek focuses on the following tasks, goals, and skills. Task. Identify a target word when presented within a sequence of two words. The ability to make correct distinctions based on individual phonemes (e.g., matching words that begin with the same sound) or other aspects of phonology (e.g., rhyming, number of syllables). The capacity for holding speech sounds in memory. This skill is needed for tasks such as comparing phonemes, relating phonemes to letters, or sounding out words. It also helps both listeners and readers understand sentences because it allows them to remember a series of words in order. The ability to hold a target word in working memory while comparing it to two alternate words to find the matching one. The ability to focus attention. The ability to process spoken words at the level of phonemes. Tomb Trek presents words that differ by initial consonant or final consonant. For example, the words big and dig differ by initial consonant. Tomb Trek includes Scientific Learning’s patented speech processing technology. At first, Tomb Trek presents words in which the speech sounds have been digitally altered using patented methods (including selective intensity increases) to provide enhanced learning opportunities. Initially, the consonant sounds in each word have been enhanced relative to the vowel sound. For example, the word bid is initially presented with acoustically modified versions of the /b/ and /d/ sounds. As the student progresses through the exercise, Tomb Trek decreases this processing, and eventually presents the words using natural speech. 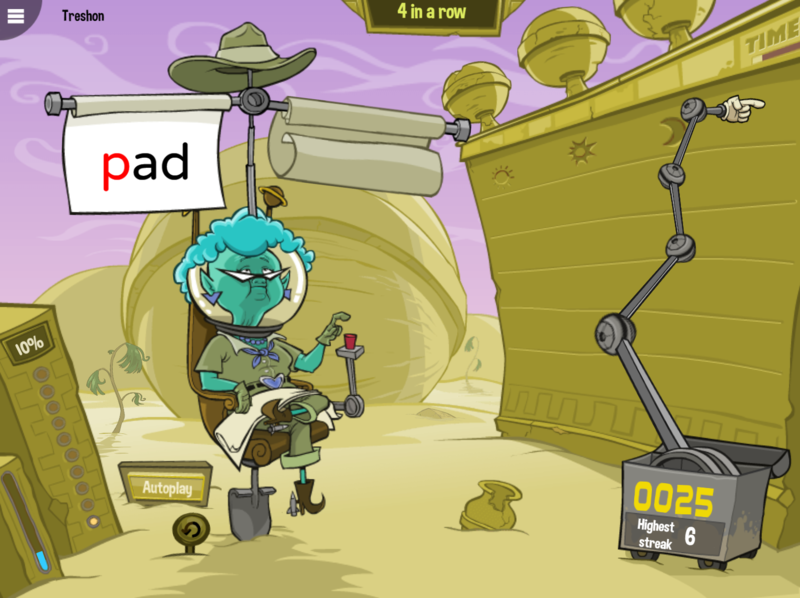 Tomb Trek takes place in a vast desert, where Granny (from Moon Ranch) has begun excavating an alien archaeological site. The object of Tomb Trek is to help Granny dig for treasure by identifying a pronounced target word when presented in a sequence of two pronounced and/or written words. To work on Tomb Trek, the student clicks the Go button to hear a target word. The exercise then presents two words on scrolls above Granny’s chair. One word is the target word, while the other is a phonologically contrasting word. The student must click the scroll that presented the target word. To help the student move from listening to reading, Tomb Trek changes the task as the student progresses through the exercise. Level 1. Tomb Trek pronounces the target word. Then, it pronounces two words while briefly displaying them on the screen. This introduces the student to the written forms of words while focusing primarily on listening skills. Level 2. Tomb Trek pronounces the target word. Then, it pronounces and displays two words on the screen, without removing them. This reinforces the association between the spoken and written forms of the words, and to use both their reading and listening skills to find target word. Level 3. Tomb Trek pronounces the target word, then displays two words on the screen silently. This requires the student to read the words and no longer rely on hearing them pronounced. Replay button. 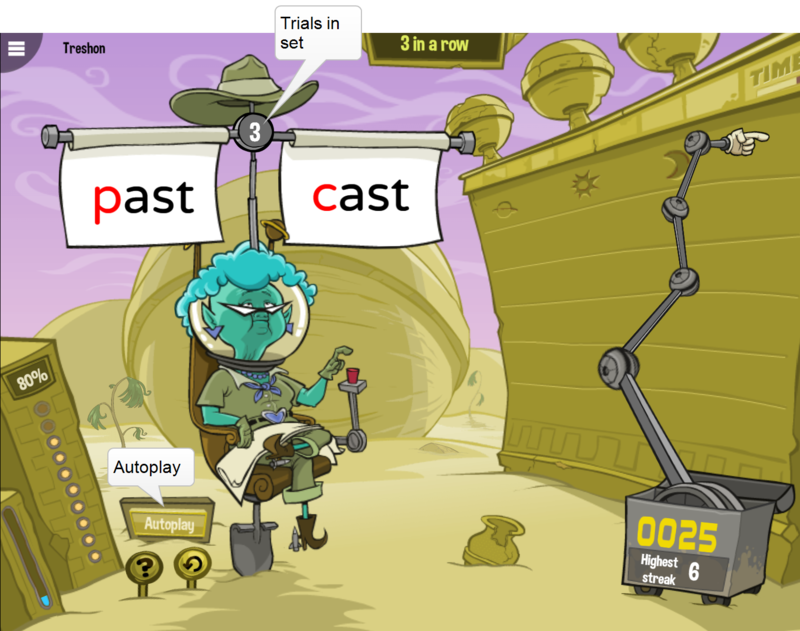 During each trial, the student can click the Replay button to repeat the stimuli again. The Replay button is only available during a trial. As the student progresses through the exercise, Tomb Trek presents the Fluency Round. In the Fluency Round, the student identifies target words displayed on a wall of gold bricks. To work on the Fluency Round, the student clicks the Go button to hear a target word pronounced. The top row of gold bricks in the wall highlights and each brick displays a word. The student must click all of the bricks that display the target word. For each correct answer, a gemstone appears in place of the word, and the exercise awards one point. The gemstone is also earned as a token, held by the tool at the bottom of the screen. The student should respond as quickly as possible, without making mistakes, to earn the most points. When the entire row is cleared of target words, the remaining words on the bricks disappear. The next row of bricks in the wall highlights and each brick displays a word. The student must continue identifying bricks with the same target word. The Fluency Round screen displays five rows of bricks. If the last row of bricks is successfully cleared before the Fluency Round ends, the first row highlights again and the Fluency Round continues as before. 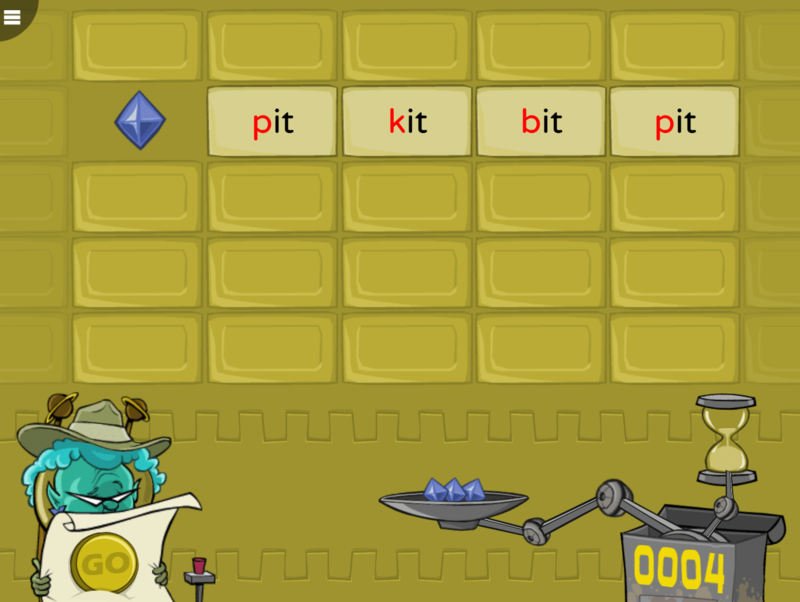 However, if a brick with an incorrect word is clicked, or a brick with a target word is missed, all tokens are lost and the Fluency Round starts over. At the end of the round, any remaining tokens are awarded as bonus points. When the Fluency Round ends, the student returns to the main exercise. Tip: Tomb Trek tracks student responses during the Fluency Round, but does not use this information to advance the student’s standing in the exercise. Instead, the Fluency Round is an opportunity for the student to review the material at a faster pace and earn extra points. At the highest level (Level 3), if the student needs assistance identifying the written words, the student can use the Help (?) button to see two words at the current set and stage. The student can click the Go button to hear a target word, and click one of two written words to hear that word pronounced. Using Help does not affect the student’s standing in Tomb Trek. Tomb Trek starts with an interactive demonstration that introduces the exercise. The introduction will not be presented again. 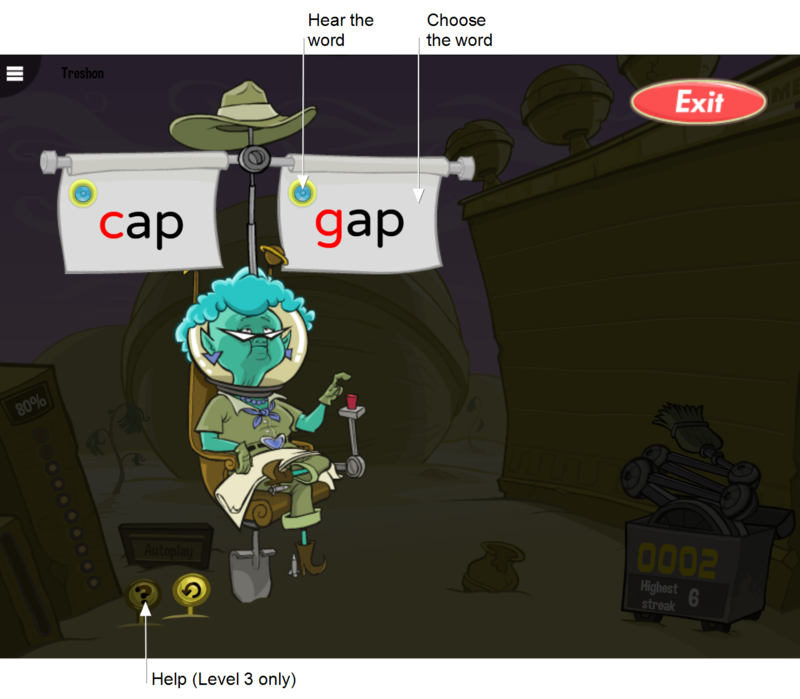 In Tomb Trek, the student progresses through three speech processing levels in the exercise. Within each level, the student progresses through 42 word sets. These sets are organized around 6 consonant sounds: /b/, /p/, /d/, /t/, /g/, and /k/. There are 4 sets for each sound in the initial position (e.g., bid vs. did) and three sets for each sound in the final position (e.g., bid vs. bit). Although the same number of sets is presented at each level, the actual words presented may vary, to provide experience working with different words and improve generalization. The following table “Word group and set examples” shows the total number of sets presented across levels. 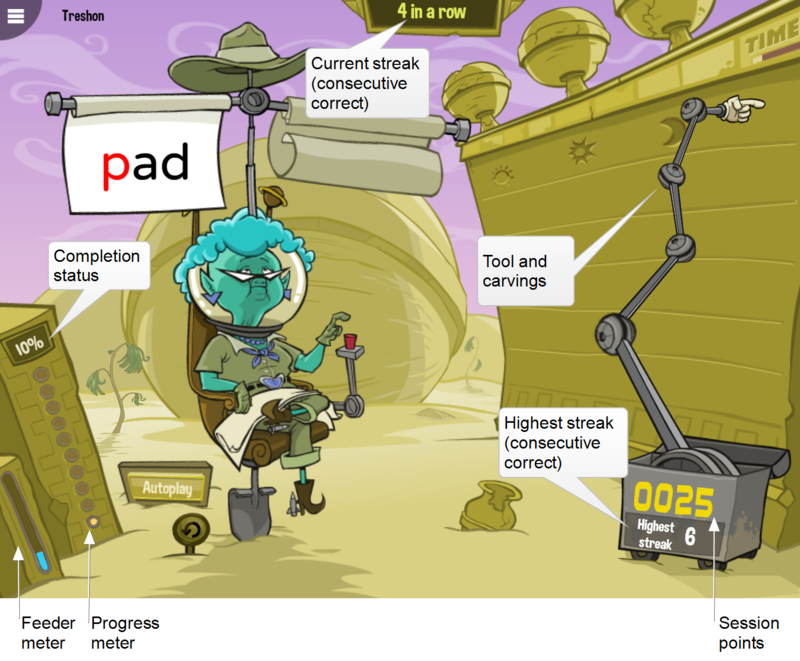 Each word set includes 3 stages, depending on the student’s performance (see Advancement). In each stage, the phoneme is changed to make the target word harder to discriminate from the alternate response. In each set, the student starts at the highest stage (Stage 3). To advance to the next word within a set, the student must answer 3 of the last 4 trials correctly. When doing well, the student may be allowed to skip some stages. When struggling, the student may need to work on all three stages. When the student completes the highest level in Tomb Trek, the exercise is complete. Tomb Trek adapts to student performance within each set, and will administer targeted interventions if the student fails a stage. If a student keeps failing a set, they will be moved to a new set. The failed set will be revisited at a later time. 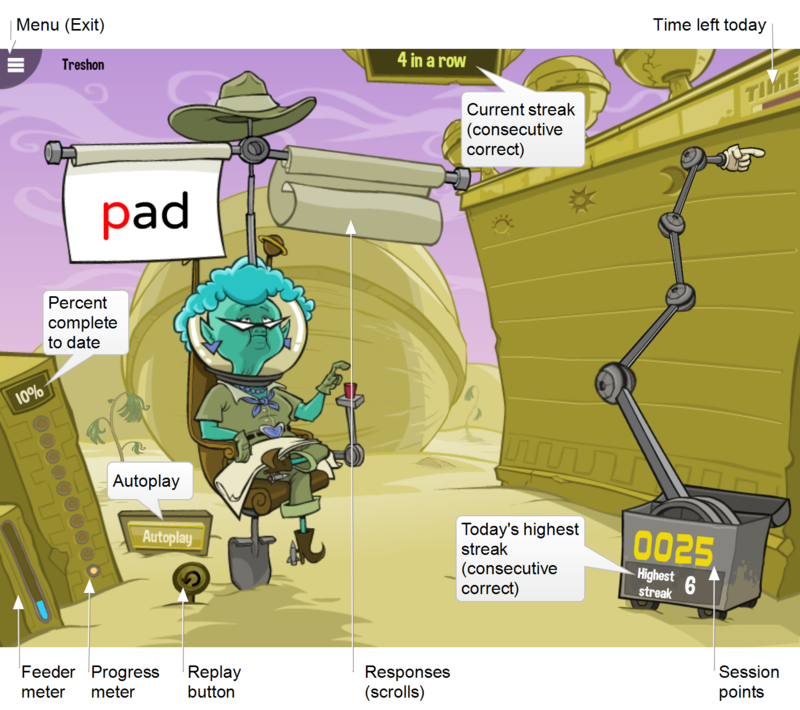 Granny’s toolbox represents the consecutive correct counter. After the first correct response, the toolbox opens and a tool appears. After the next consecutive correct response, the tool prepares to work on the wall. When the student answers the third consecutive trial correctly, the tool uncovers an alien glyph, an artifact, or a button that triggers a fun animation and returns to the toolbox. When all of the items in the scene are uncovered, a reward animation plays and Granny moves to the next room. Each work session includes a performance goal to help motivate the student. In Tomb Trek, the student’s goal is to advance to the treasure room and earn treasure. When the student meets the goal, the treasure room opens and more treasure appears in the room. Once earned, these rewards cannot be lost; the treasure will remain visible until the entire product is finished.